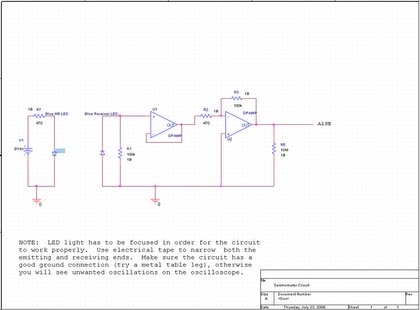 This circuit proposes a unique use for LEDs in the form of mechanical movement. This circuit utilizes two LEDs with their leads bent at right angles to face each other. The receiving LED should be reinforced so that it cannot move if their is vibration near. When the LEDs are directly aligned with one another, the output voltage from the op amp will be seen on the oscilloscope as a straight horizontal line. Tapping the table (creating a vibration), will cause the emitting LED to oscillate slightly. On the oscilloscope, this vibration can be seen as a small seismic blip (similar to the ones seen on seismometers used in earthquake measurements). This circuit requires some initial calibration, but once set up, it can be adjusted to be sensitive to various amounts of vibration.